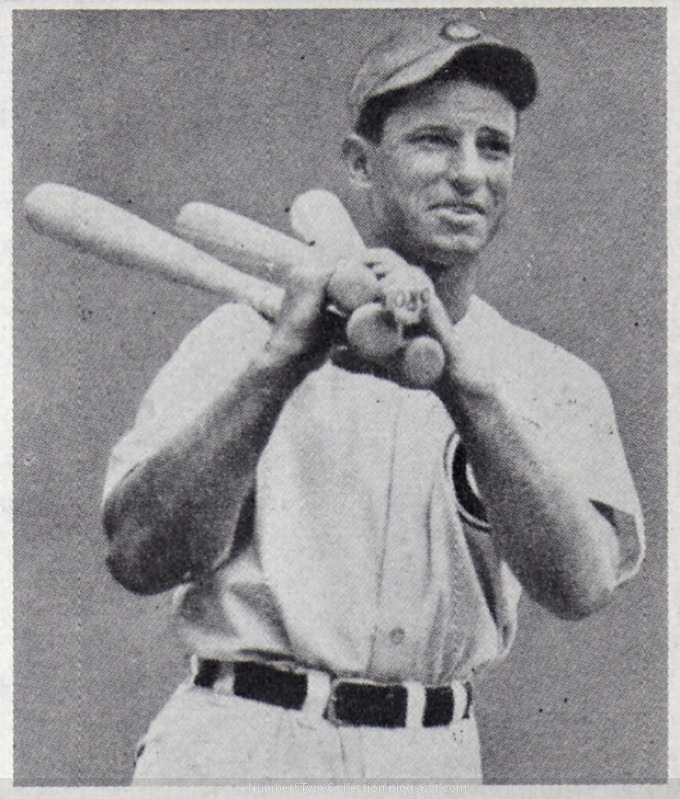 Many collectors know slugger Andy Pafko for his Topps position of honor as their first 1952 card. While disregarded (and "undervalued") as a significant position into the 1980s, Upper Deck's use of Ken Griffey, Jr. to kick off their 1989 set also raised the profiles of vintage #1s, including Pafko. These days, even low-grade versions go for more than $100. Philly Show promoters Ted Taylor (HRT) and Bob Schmierer (RES) created this "prequel" to 1948 Bowman baseball as a sibling to their 1942 Play Ball issue, already profiled in April 2010. Its 113 cards came out in 3 series and included both active players (like Pafko) and HOFers (like Ruth and Gehrig). 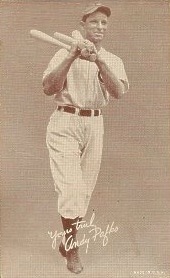 Wisconsin native Pafko played most of his lengthy career close to home, starting with 9 years in Chicago and closing with 7 in Milwaukee, including their 1957 World Series win. 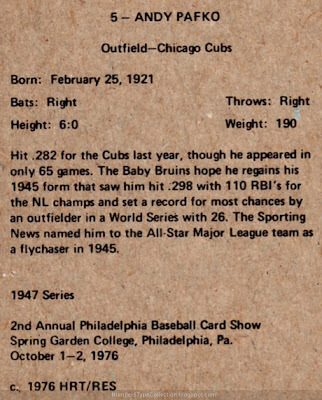 I'd never heard "Baby Bruins" as a nickname for the Cubbies before, but won't soon forget it. UPDATE: Thanks to blog Vintage Sportscards, I learned that HRT/RES cropped their photo from this Andy Pafko Exhibit card. 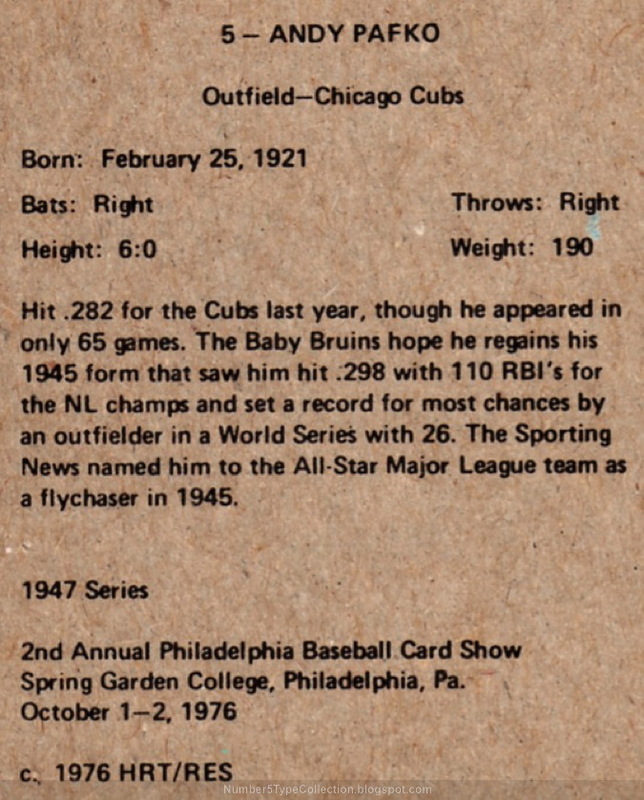 Value: I bought this card on Beckett Marketplace for $3, about right for a mid-70s oddball set. Fakes / reprints: This is already an homage to vintage Bowman cards, if not exactly a reprint, and I doubt anyone would print another run of them.